The development of mail service in Russia paralleled the development of that service in many other countries. Transport of mail began along ancient trade routes and later by rail. Stamped envelopes were introduced in 1845 in St. Petersburg and a year later in Moscow. Russia No. 1 stamp was issued in 1858. However, this development was too slow for the needs of rural areas that were beyond the reach of trade routes and railroad lines. To provide mail service in these remote areas county administrations called "zemstvo", i.e. rural, 1 took it upon themselves to establish mail service and connect it with the mail service of the central government. It was natural for zemstvos to expend their administrative duties since they were already responsible for road maintenance, elementary schools, clinics and hospitals, law enforcement, veterinary service, promotion of trade and other activities that benefited their county. By the law of the land, mail service was a monopoly of the central government and zemstvo post could operate only as an extention and not in competition with government's mail service. It is in 1865 that mail services were inaugurated in several zemstvos based upon sweeping reform laws of January 1, 1864. Zemstvos could handle official and private mail only within its own county. Imperial mail as a rule did reach county seats, so it is there that the two postal systems exchanged mail. Mail addressed outside of the county was transferred to the central government PO and required state postage in addition to the zemstvo fee if that zemstvo required payment; there were zemstvos that handled mail free of charge. The reverse was also true: incoming mail from the central government post was transferred to the zemstvo postal system for customer delivery. The government postal system had a Postmaster-General and the system operated under one set of rules across the nation. Each zemstvo with postal service had its own Postmaster-General and elected zemstvo assembly set the operating procedures, fees, postal routes and frequency of mail delivery. Most zemstvos with mail service issued stamps and stamped envelopes of their own design. Only one rule governed the design of zemstvo stamps -they could not resemble government-issue stamps. Early philatelists in Russia and Europe collected primarily mint zemstvo stamps and an occasional cover with canceled zemstvo stamp. To some extent, this trend continues today. However, there were zemstvos with mail service that did not issue stamps, zemstvos that continues mail service but discontinued to issue stamps and zemstvos that provided mail service free of charge. Since no stamps were involved, this area remained largely neglected. This exhibit shows stampless zemstvo mail in six categories, each category labeled by a different print color, arranged according to Russian alphabet, while the description of the exhibit on each page remains in black. 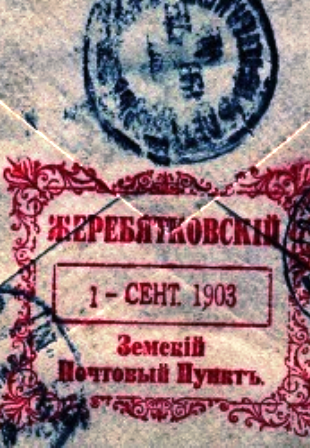 Category 1, black: on-stamp issuing zemstvo with mail service. Category 2, red: Zemstvos that discontinued issuing stamps but continued to provide mail service. Category 3, brown: Zemstvos that provided mail service free of charge for incoming mail. Category 4, green: Zemstvo mail in Cossack lands. Category 5, blue: Mail handled by zemstvo administration offices without explicit reference to postal serv1ce, per se. Category 6, pink: Stamp issuing zemstvos forwarding correspondence free of charge. Zemstvo postal history is a difficult area to study because detailed records are nonexistent. During Soviet rule, zemstvo records were considered "useless remnants of the old autocratic regime" and were discarded. Furthermore, the zemstvos, which were freely elected county administrative units, were eliminated by victorious Bolsheviks in order to maintain one-party dictatorship. By 1918 zemstvos as an institution and, for the most part, their records ceased to exist. A great deal of what was left was destroyed during WW2. It should be noted that any zemstvo mail to and from abroad is scarce.